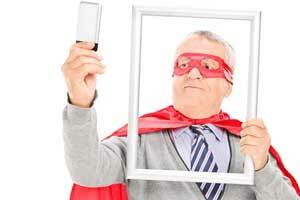 Chances are you’ve not only heard of selfies by now but also taken your own, whether you’re a teen or a Baby Boomer. In fact, the popularity of the selfie seems unstoppable as people keep taking pics of themselves with nearly ubiquitous smartphones and posting them to social media sites—Instagram, Facebook, Twitter, Pinterest, Google +, and more. So how is this trend relevant to promoting your business? The selfie has opened up opportunities for brands to market themselves online. Selfies are highly effective at driving likes, shares, and comments on a user’s post, and brands can make use of this trend to increase awareness of and engagement with their products and services among fans and followers. If your business hasn’t tapped into the power of the selfie yet, it’s time to get busy. With the right planning and strategy, a selfie business campaign can be a great way to engage and connect both current and potential users and customers with your brand and products. Let’s say a clothing retailer posts photos of models wearing its clothes on its website or social media accounts. Once sales occur, images of customers wearing the outfits can then be posted. This approach reassures potential customers that the merchandise fits across a wide range of shapes and sizes, for example. Moreover, instead of using standard “catalog-style” models, experienced customers can help new customers relate to the products better. How can you use selfies as part of your company’s marketing strategy? It’s important to not just jump onto the selfie bandwagon headfirst; rather, to be successful, you first need to carefully monitor, listen to, and interact with the users you are hoping to reach. The more honest you are in those interactions, the better the audience will respond. Introduce yourself. Think about it: Social media is all about sharing and engaging. A selfie taken on your last trip could be a great icebreaker for asking your customers what they did last weekend or what their favorite hobbies are. Care about your customers, and they will care about your brand and business. Connect with the community. Selfies can be a great medium for promoting your local community. Post a photo of you and the local school’s mascot or at the froyo place on the corner, and help spread the word about what your community has to offer. Promote your business’s human side. Selfies can be useful for capturing the “behind-the-scenes” moments at your office. You can better build affinity with the personal touch that comes with including a face, not just a product, in your photos. Make it competitive. Some businesses hold contests that encourage fans and followers to take photos of themselves with particular products. Users then post the photos on Facebook, Twitter, or Instagram with a particular hashtag, giving the business increased reach across multiple social media platforms. Some businesses also offer discounts or rewards for users who post selfies of themselves engaging with the business’s products. Spread holiday cheer. Entertain your clients and audience for free by posting a picture of you wearing a Santa hat. Or capture a shot of you wearing a funny Halloween costume. Doing so can definitely add that personal touch to your business’s message. Introduce a new product. Social media users often post selfies when they’ve changed their hair or something else about their appearance: They’re proud of their new look and want to get feedback. When your business releases a new product or a new solution, you should do the same. Photographing yourself with your accomplishments can enhance the personal side of your business and help you sell your products. Everyone’s doing it. Selfies of brand ambassadors and executives who own the product add weight to a promotion, just as celebrities’ selfies showcasing that they themselves use a particular product can attract customers. Linking selfies directly to the product can create a feeling of trust among customers—which is critical to their making a purchase. Trends can present businesses with a ready-made audience, and the selfie craze is no exception. However, it’s important to understand your audience before you grab your smartphone and start clicking away. When used properly, selfies have become yet another tool for generating product buzz and ultimately helping drive sales.